You might remember that I experienced my Gelato Messina epiphany over a scoop of Mr Potatohead icecream, a daring and expertly rendered combination of peanut butter gelato, white chocolate and potato chips. Given my imminent departure from Sydney and the icecream's imminent departure from the specials board, I set my mind to making some more.... and making it more vegan, so as to share it around. My last batch of peanut butter icecream set like a rock, so I needed a new formula. Serious Eats, on their annual month-long vegan kick, came through within days, discussing vegan ice-cream making in general and a salted peanut butter flavour in particular. Like me, they choose coconut milk and cream as a dairy substitute. Unlike me of the past, they use light corn syrup as one of their sweeteners - I wondered if this would have a similar effect to the liquid glucose that Eliza Metcalfe recommended to me last year. And what of the chips - how to prevent them getting soggy? I suspected that Gelato Messina was coating them in the white chocolate in order to insulate them from the gelato mixture. I bought the thickest kettle chips I could find and used an equal weight of rice milk-base white chocolate for the experiment ahead. The final result was a respectable tribute to Gelato Messina's original triumph. It had a clear creamy peanut butter base - much improved on my past effort, but still requiring 20 minutes to soften and scoop. It was dense where Messina's is fluffy. The potato chips kept just enough of their crunch and melded as they should. I shared most of the batch with friends, and quietly converted them to the magic of potato chips in icecream. One of them was junk-drunk enough to claim it was the best icecream they've ever eaten. Presumably they haven't been to Gelato Messina yet. In a medium saucepan, stir together the coconut milk, coconut cream, corn syrup and brown sugar. Set them over medium heat, stirring regularly as the sugar dissolves, until they're up to a simmer. Turn off the heat, add the peanut butter, and use a stick blender to combine until completely smooth. Stir in the vanilla and salt, cover, and refrigerate until very cold, preferably overnight. Gently melt the chocolate in a small saucepan and take it off the heat. 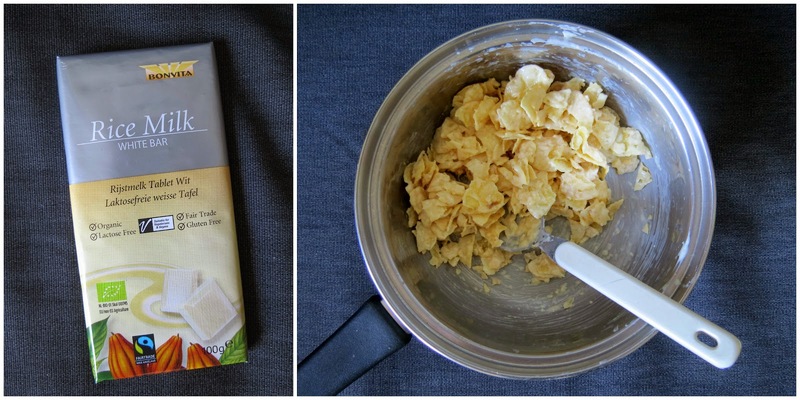 Roughly crush the potato chips - but just roughly, you don't want potato powder! - and add them to the chocolate. Stir the chips and chocolate together until the potato chips are thinly but thoroughly coated in chocolate. Transfer the chips to an airtight container and allow them to cool and set - you might even like to refrigerate them. When the peanut butter mixture is very cold, pour it into an icecream maker and churn it according to the manufacturer's instructions. While it is churning, break the choc-coated chips into large chunks. Pour the peanut butter icecream into an airtight container a couple of large spoonfuls at a time, scattering them with the chips as you go. Freeze the icecream until you're ready to scoop and serve - it will probably be at its peak in 4 hours. well done - sounds like an excellent ice cream - you always manage to make an ice cream machine look tempting - I was wondering recently if I could substitute glucose syrup for corn syrup - but can't remember the recipe. Thanks, Johanna! I'm still learning, but I think glucose syrup and corn syrup are both 'inverted sugar' so they have some properties in common - in the case of ice cream they're less inclined to crystalise than sucrose. I love the "cheap 'n' nasty peanut butter" specification. It reminds me of when my Dad sent me out to buy PB for the purpose of humanely catching mice: "Don't get the healthy stuff, you need some rubbish with lots of sugar and salt or they won't go for it". Ha! I don't mind the extra salt, either. In this recipe, I think it's particularly important to have a peanut butter that's extremely smooth and not inclined to separate during preparation.